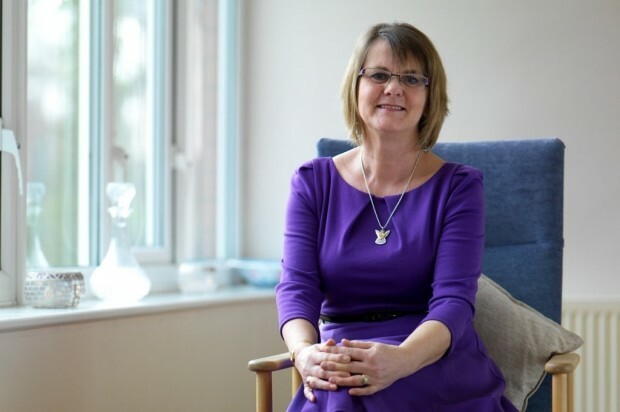 Lynda was diagnosed with cancer when she was 46. She found the craft groups at Cancer Help to be a welcome change to the clinical environment of hospital. So much so that following successful treatment Lynda became a volunteer. “When I was diagnosed with breast cancer at 46 even my GP was shocked. I began the long and traumatic journey cancer brings. I was introduced to the surgeons and breast care nurses at Chorley Hospital who in turn introduced me to Cancer Help and Vine House. I came to look round and found the atmosphere relaxed and non-clinical. This was very important to me after all the poking and prodding by doctors. I decided I would like to join the egg-craft and glass engraving classes as soon as I was well enough after surgery. I’m not sure the men of the glass engraving group knew what had hit them with my wigs and fairy glass engravings. They never knew what colour my hair would be from week to week. The egg-craft class was a group of fun loving women of all ages, some older and some younger than me. We laughed and moaned together so I couldn’t feel miserable for too long even when the chemo made me feel bad and my hair fell out. The new skills Susan (the teacher) taught me gave me a greater level of confidence, which the treatment had taken away. The support given to me by Susan and the other ladies, all of whom had experienced cancer in one way or another, was fantastic and made the whole process more bearable as they knew what I was going through. I also benefitted from reflexology which took away some of the stress I was feeling. Sessions with the counsellor also helped to put things into perspective. When I returned to work after my treatment ended I could no longer attend Cancer Help. However, a short time later, I changed my job which allowed me time to volunteer at Cancer Help’s Vine House. I joined Susan on Tuesday’s as a class helper in the egg-craft class and have enjoyed helping others to learn the new skills I was taught. As a volunteer I gain so much. Seeing patients have their minds taken off the disease and treatment for a short time is rewarding and we have fun together. In 2010 I rejoined the ranks of patient at Cancer Help when my husband was diagnosed with cancer. Although I continued to volunteer, I also had support from the staff in many ways to help me cope with the problems caused during this difficult time. Unfortunately my husband was not as lucky as me and he died last year. I experienced the continuing care that Cancer Help provides. I have recently joined the bereavement group where sharing my experiences and feelings with others in a similar position has helped me cope with this difficult process.